We recently printed some business cards for our Stack Exchange employees and they turned out great. It got us thinking: our sites' moderators have been working hard to keep our sites high quality for the past few years. They may not be employees, per se, but great community moderators are why our communities are safe, sane, and worth visiting in the first place.. 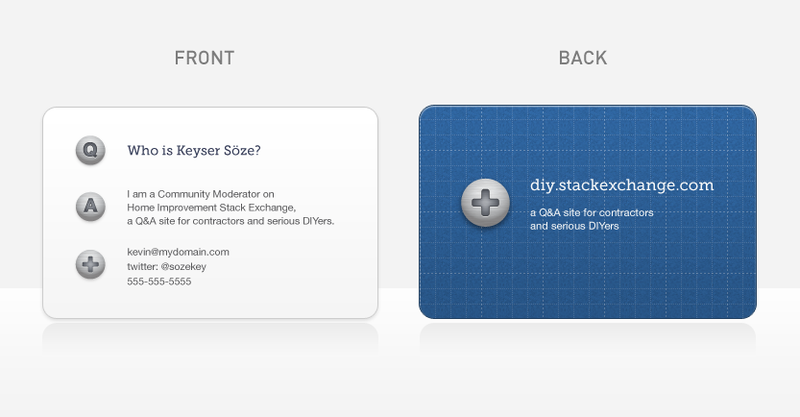 If you're a moderator, would you be interested in having your own Home Improvement Stack Exchange contact card? Would you find it useful? I can see them being handy to pass out to friends and family who love DIY. Of course Twitter ID/phone# are optional. It can be Skype, AIM, URL etc. Note: the text rendering in the mockup is slightly blurry. But when printed it will be crisp. OK, the cards are now available -- all current moderators were mailed a link to the form to customize the cards. Enjoy! I can see these as being useful to stick into the boards they have at our local DIY stores that advertise local businesses. I'd have to be careful about the contact details - but yes I'd take a box.